Forget English soap operas about upstairs and downstairs upheavals, Yoji Yamada’s chronicle of a life in the little Tokyo house with the little red roof is an emotional grabber. It’s the war years of patriotic acquiescence and home-front selfishness — and a secret, forbidden romance. When Twilight Time brings out a disc not licensed from a major studio, I pay special attention. Last year they released a good Yoji Yamada film called The Twilight Samurai, and now the director’s epic domestic drama The Little House. Yamada is best known as the man behind the long-running film series Tora-San. He uses a couple of the same actors from that era. This film’s star, already one of the most honored actresses in Japan, made her first film in 2011. The film is from just last year yet belongs with older sentimental classics like Keisuke Kinoshita’s Twenty-Four Eyes (1954) and Kon Ichikawa’s The Makioka Sisters (1983). Each is an extended-family drama spanning the years before and during World War II, and each has a slightly different take on the ‘issues.’ As it deals with events seventy years in the past, this movie cleverly filters things through the emotions of grandchildren. The frustration of having new feelings that can’t be shared with departed relatives is a universally understandable. Director Yamada appears to have co-written his film with two women screenwriters, giving the female characters the same depth and credibility found in the Ichikawa classic. 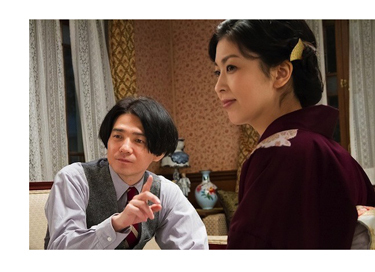 Old great-aunt Taki Nunomiya (Cheiko Baisho) passes away, and her great-nephew Takeshi Arai (Satoshi Tsumabuki) locates an account of her life that he encouraged her to write. Around 1935, rural daughter Taki (Haru Kuroki) travels to Tokyo to become a maid, a job requiring judgment and discretion. She becomes ‘Taki Dear,’ a cherished member of the Harai family, especially after she takes an aggressive role helping their young son Kyochi (Satoshi Akiyama) recover from a debilitating case of polio. Mr. Harai (Takataro Kataoka) is in the toy business, which is deeply impacted by a scarcity of raw materials that comes with Japan’s turning to the conquest of China. The war eventually becomes a World War, and its effects are felt on the family in shortages and new definitions of what is unpatriotic behavior. The Hirais splurged on an attractive house with a distinctive red roof, a choice that the beautiful Tokiko Harai (Takako Matsu) defends against the criticisms of her nosy sister. The major impact on the family is young toy designer Masaharu Itakura (Hidetaka Yoshioka), a sensitive man considered unfit for military duty. Itakura resists Mr. Harai’s insistence that he make a political marriage advantageous to the toy company. The handsome designer instead falls in love with Tokiko, and an affair commences. Taki’s discretion is sorely taxed as Tokiko and Itakura’s relationship continues — until Japan becomes so desperate for soldiers that even Itakura is called up. what became of the main ‘characters.’ A second level of story shows Takeshi just a year or so earlier, visiting his elderly aunt and engaging in arguments about the story she’s writing — he doesn’t understand why her memories don’t address some of the historical facts and milestones he thinks are important. The bulk of the show dramatizes Taki’s experience from 1935 to 1945 — even though some scenes show things she didn’t witness directly. The acting all around is exceptional, as is the general respect given the characters. The family members in the present have good attitudes about the past, even though Takeshi expects his book-learned historical opinions to be borne out in his aunt’s memoir. He had a marvelous relationship with the old lady, even when they argued. The saga of the bourgeois Harai family is fairly straightforward. Besides the potential disaster with Kyochi’s polio, they have it pretty easy. Tokiko only has a busybody sister to worry about. They treat Taki well, even if Tokiko is a bit too willing to let her maid do all the hard work of hauling Kyochi to a distant doctor, and massaging his legs for hours at a time. Tokiko even asks the obviously exhausted Taki to massage her legs as well. Mr. Harai is somewhat buffoonish and autocratic, exercising his male authority in the household while demonstrating that he’s a yes-man to the company president. Harai is willing to go along with war politics because it’s good for business — the toymaker’s name isn’t Nintendo, but they dream of future selling markets in China and America. The big boss has visited America, so the employees must listen when the man tells them about American steaks, and the beautiful women who show their long legs. When it comes time to strong-arm Itakura into taking a wife, Mr. Harai thoughtlessly assigns the job to Takiko, thereby all but throwing her into the attractive man’s arms. The young designer loves kids, music and art. He lives like a pauper and devours Taki’s noodles as if he were starving. Both Taki and Tokiko think he’s a dreamboat. The elegant, vain Tokiko needs Taki’s help to prevent Tokiko’s indiscretions from causing a domestic disaster. She has no real help. The nosy sister is part of the problem, and a family friend, a ‘mannish’ woman who gives Taki some advice, appears to have been in love with Tokiko back in school. When Taki finally intervenes, events conspire to make her think she’s made a terrible mistake. The female relationships aren’t as codified / fascinating as in Makioka Sisters, but some dicey feelings are aroused. The sensual Tokiko would seem to step over the line of servant-client propriety when she solicits Taki’s massage. What does Taki’s blush convey? Whatever it may be, none of the characters really wants to upset the applecart. Tokiko wants her red-roofed cozy existence. The merchants save black market goods for their best customers. Even Itakura accepts his near-suicidal army enlistment in a patriotic spirit. The 1954 Twenty-Four Eyes never confronts the moral issues of the war directly, reflecting a society that certainly wasn’t ready to do so. The 1983 Makioka movie acknowledges more of the madness, but it’s not only other societies that refuse to acknowledge war guilt. I’ll probably be long gone before mainstream American movies dare openly condemn our own Middle Eastern wars. The Little House adroitly shows the neighborhood folk stepping outside to wave their little battle flags, and then going back to their selfish pursuits. The Hirais hope that their particular vices won’t be singled out as disloyal. Showing the businessmen thinking solely in greedy terms is refreshingly honest, and certainly not restricted to any single nationality’s war experience. Of all the film’s actors, new star Haru Kuroki takes the prize. She expresses feelings quite well in normal situations, but in those rare instances when Taki permits her full emotions to come through, she’s devastating. She bawls like a baby, but when happy beams with smiles that warm the heart — I can only compare her smile to movie moments with radiant women like Maria Schell, and Romy Schneider. Ms. Kuroki is a real actor-communicator. 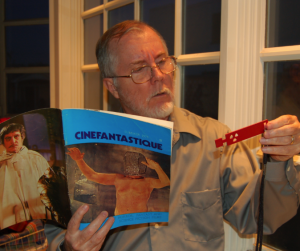 The film is deceptively small-scale. There are no crowd scenes but they aren’t missed. Taki’s advent into the ‘miracle city’ of 1935 Tokyo is handled with a few B&W photos. Some storm and snow scenes are beautifully handled, while a sequence of the firebombing of Tokyo is a pictorial abstraction, not reality. The earlier views of the cute red house on the hill form a highly nostalgic image of an idealized bourgeois Tokyo, prior to the firestorms. The house even has a cute picket fence. Was Yoji Yamada’s The Little House even distributed here? It’s been reviewed by the whole planet but very few U.S. critics. I’m beginning to think that quality foreign cinema is giving the U.S. market a wide berth, as they know we are Marvel-brained philistines disinterested in the rest of the world, and not just in movies. The Little House is about something other than the grotesque Reality Show that is our present state of affairs. The Twilight Time Blu-ray of The Little House is a beautiful encoding of this shot-on-film, good-looking feature. Although not quite as formal as classic Japanese cinema, it embraces a refreshingly un-mannered less-is-more pictorial quality. Joe Hisaishi’s (Spirited Away) music cues make us feel like we’re watching something important as well. 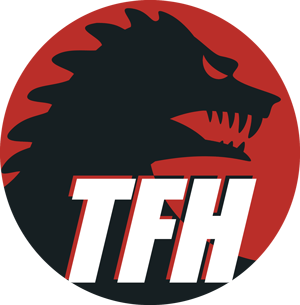 TT gives us the music in an Isolated Score Track, as well as a trailer and several short teasers for the movie. Julie Kirgo’s liner notes place this pleasant, emotional drama in the context of Yoji Yamada’s other films, and point out contextual details in the characters many viewers might miss. But overall The Little House is more than accessible to American audiences.